I was quite honestly never a big drinker before I turned 21. Neither of my parents drink (for various reasons), and they always taught me from a young age about how alcohol is truly a drug and not just a drink. My high school friend group wasn't into drinking, and the college that I went to my freshman year was actually a dry campus school! And both for legal and moral/faith reasons I never had any interest in having a fake ID. But now that I'm finally 21, it's time to enjoy some good ol' fashioned adult privileges!! I haven't been going crazy or anything. ;-) But so far this week I have been enjoying making my favorite "cocktail" (recipe to come soon- super easy! ), and also enjoying having wine in my dorm's mini fridge for the first time! So of course my collaboration project with Top Shelf Glassware truly couldn't have come at a better time! Top Shelf Glassware makes the cutest glasses and other drink accessories on the market- I swear! When my package arrived with all of the wine glasses inside, there was also a catalogue of all of their merchandise, and I have been continuing to oooh and ahhh over it. (My thought process reading their catalogue is literally "A best friend wine glass? Need that for my besties! The Boston wine glass? I'm from Maine so close enough! 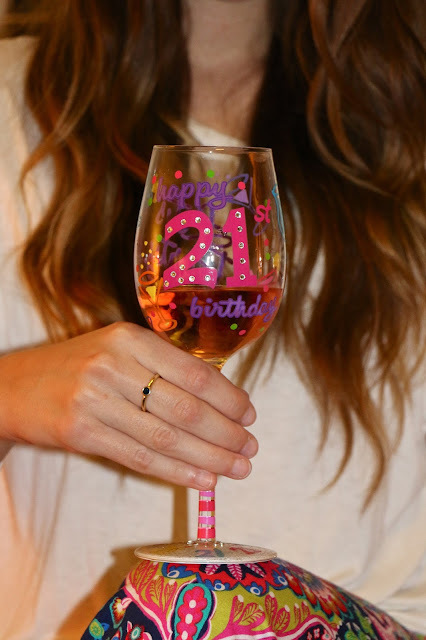 The 30th birthday wine glass? So cute.... and that's only nine years away!") 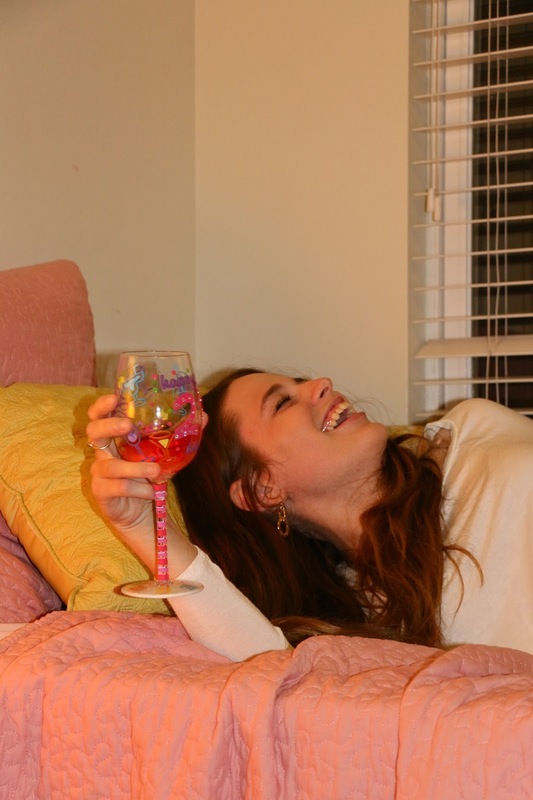 I was sent a selection of 21st birthday wine glassware to review, as well as a fun glass that says "Shhhh... there's wine in there" which I'm holding in the first photo! 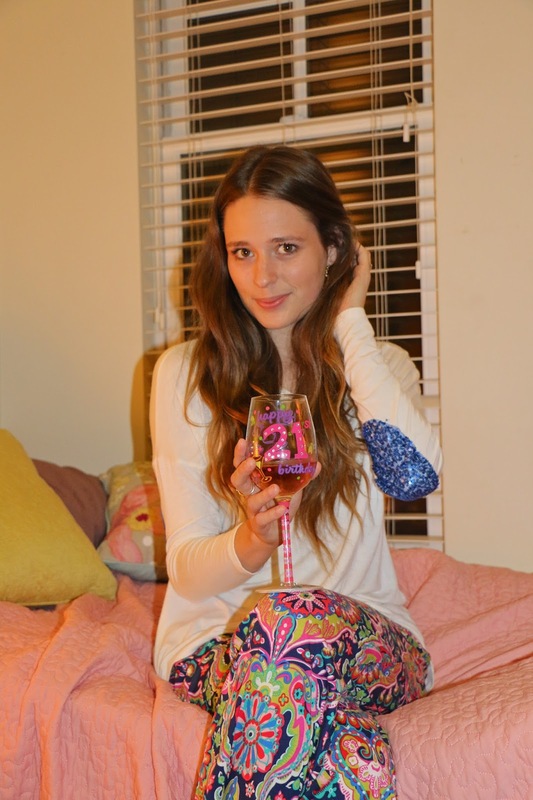 I am absolutely obsessed with all of Top Shelf's 21st birthday glassware! Everything is totally blinged out and features really fun and bright colors, and I know I'll be enjoying wine nights out of these pretty things all year long! These glasses make even the simplest Wine Night fun... for these pictures I was actually just hanging out in PJs in my suitemate's room, enjoying some girl time with her and our bottle of Moscato! Top Shelf's products aren't currently available for sale through their direct website, but Amazon carries a large selection of their glassware! Top Shelf glasses are also carried at many independent gift shops and boutiques across the country. 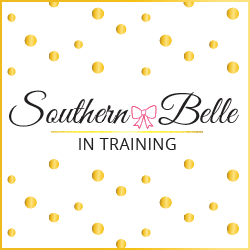 I am a fan of shopping local when I can, so check out this handy store locator guide on their website to find the store nearest you that carries their line! Lastly- do y'all have any wine recommendations for me? Or really any drink recommendations? Being not a big drinker before I turned 21 means that I am completely clueless when it comes to knowing my alcohols- ha! All I know is that the next "adult" thing that I do will be to buy some rum and bake a rum cake... rum cake has been my favorite for years and I've always been frustrated that I couldn't buy the main ingredient! Half moscato half sprite is a favorite of mine! Or Rain Organic flavored vodka with LaCroix sparkling water .. love your wine glasses!! Oh my gooooosh, I have that exact wine in my fridge at the moment. Looking forward to taking it out tonight! You need to try Moscato D'Asti by Cupcake wines. As a new wine drinker, you'll love this one if you're a sweet tooth! I love moscato. I'm not really a big drinker, though. I love the decorated wine glasses- so cute! I used to love the "Be." wines like Be Radient and Be Peachy! I'm mostly a red wine drinker now, but those were my favorites when I first turned 21 as well! Also pretty cheap if you're able to find it! That glass is adorable! Love your pants, too! I love these glasses -- so cute! I second Grace, my favorite wine is the Moscato by Cupcake and also Primo Amore Moscato. Wine is a great starter. You can make sangria, spritzers, and a number of other drinks out of it. Personally though, I am a liquor girl. Flavored vodka and rum are amazing. You can make pretty much anything out of either of them. If you're looking to buy some more at a reasonable price, World Market has a pretty good selection. I have too many recipes to list from when I bartended during my undergrad degree. There are a lot of good bartending apps out there too now. You are adorable, and I love your cute little glasses :) If you're looking to try something that you won't taste the alcohol in, try a vodka cranberry! How cute are you?! I love that glass and wine stopper! Perfect 21 birthday memorabilia! I've been all about hard cider's lately! If you love apple cider, definitely give it a try! These are so pretty! I love your pictures, they're so much fun. I'll definitely have to check these glasses out! Great post! Those glasses are so cute, happy belated birthday! Those glasses are so cute! I loved long stem wine glasses until a friend gave me a ton of crystal stemless wine glasses and they now rule my world. I LOVE LOVE LOVE Cabernets and red blends, but they definitely took some getting used to! That glass is so cute! I've been trying to cut out alcohol and caffeine in effort to be healthier! Whiskey gingers are my go-to drink, and cabernet savignion is my fave type of wine :) Welcome to the 21 club!! P.S., I love that cup, it's so fun! Can I take a moment to mention your pants?! LOVE! 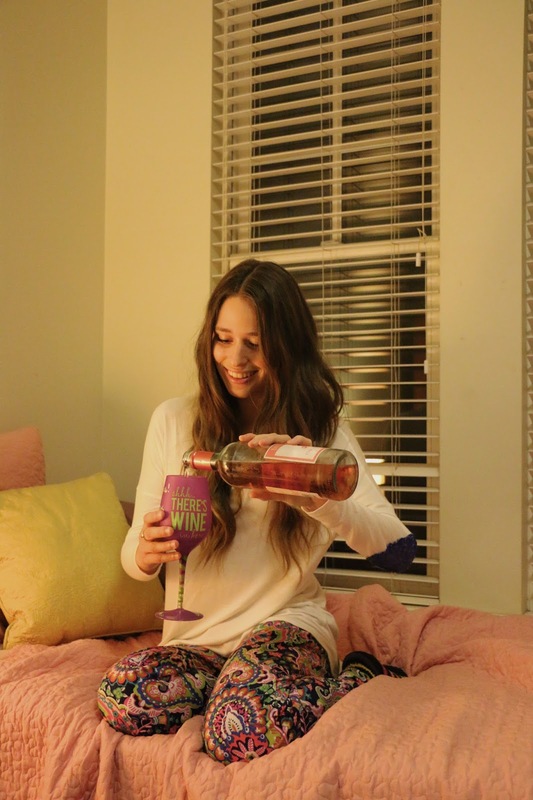 That wineglass is adorable, and so are you! Looks like a fun night! Nothing - NOTHING! - beats wine night. Your wineglass is too cute!